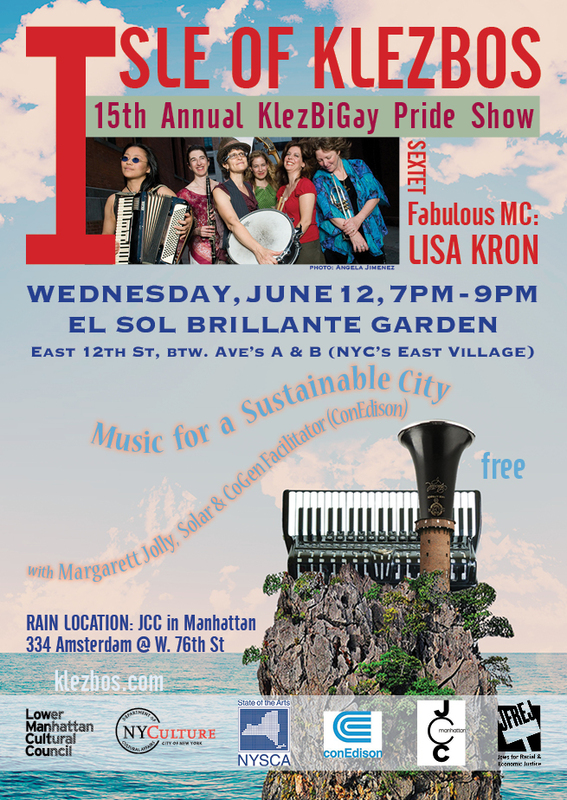 Join us Wednesday, June 12 for our our 15th annual KlezBiGay Pride show, Isle of Klezbos: Music for a Sustainable City - free! Rain or shine. This year’s MC will be hilarious & insightful Obie Award-winning actress / playwright Lisa Kron (WELL [Tony nomination], Fun Home, 2.5 Minute Ride, Five Lesbian Brothers, Good Person of Szechwan), and we will also feature renewable energy maven Margarett Jolly of Con Edison with Solar One generator powering our sound system. Isle of Klezbos plays two music sets with our full sextet. Outdoors (weather permitting) at El Sol Brillante Garden: East 12th Street, between Avenues A and B in NYC’s East Village. Rain location The JCC in Manhattan: 334 Amsterdam Ave at West 76th Street. “Isle of Klezbos: Music for a Sustainable City” is made possible in part with public funds from the Fund for Creative Communities, supported by New York State Council on the Arts with the support of Governor Andrew Cuomo and the New York State Legislature; and from the Manhattan Community Arts Fund, supported by the New York City Department of Cultural Affirs in partnership with the City Council; both administered by the Lower Manhattan Cultural Council. Thanks also to our fiscal sponsor, Jews for Racial & Economic Justice [JFREJ] and the East Village’s El Sol Brillante Garden.